Putting these together every week has been one of my absolute highlights. These were never meant to be all that serious, but rather fun posts for me to explore colors that are trending and that we can all incorporate into our wardrobes (or decor) relatively easily and affordably. I saved my favorite for last: canary yellow. When I say canary yellow, however, I don't mean just bright yellow; I mean shades of chartreuse or lemon, mustard or rusty. All shades of yellow apply here, as long as it's beautiful, bright, and sunny. Let's jump in and talk about yellow--and what's inspiring me for this color! Yellow is one of those colors that is simultaneously always in fashion, but feels difficult to wear. When we talk about "yellow," some people imagine it as a sickly color or a childish color. Baby nurseries are butter yellow or sunny yellow. I once read a poem that described hospitals as smelling yellow. Some have mixed feelings about yellow... but I love it. A few years ago, mustard yellow everything was the trend. I had a mustard yellow skirt that I ended up shrinking in the washing machine (RIP yellow skirt) and a mustard yellow cardigan that I wore to my first ultrasound appointment. Mustard yellow was everywhere. Yellow can be one of those colors that's a little bit of everything; it goes with neutrals, but it can be paired with other bright or primary colors for a little bit of fun. It can be sunny, or preppy, or athletic. It can be whatever you want it to be. I specifically like it in these two color palettes because you can see how well it pairs with other neutrals (with gray for a more modern look, or with brown for something that's a little 1970s reminiscent). The cross-body bag trend isn't going away anytime soon. I know novelty bags are just that--novelties, a little impractical for day-to-day life. But just imagine wearing this lemon wedge bag with jeans and a gray cardigan to brunch. It's big enough to carry your essentials and cute enough to remind us that, despite the fact that it's snowing in places it really shouldn't, spring is coming! 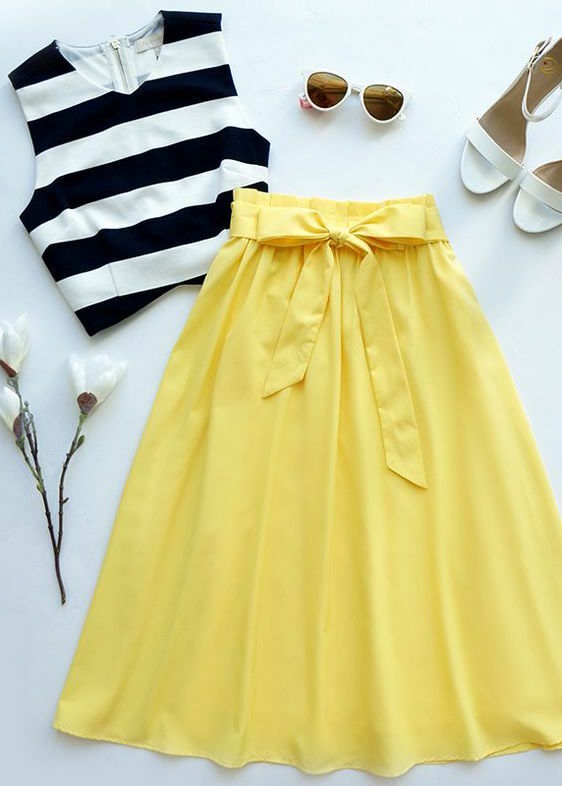 This skirt reminds me so much of the mustard skirt I had... I almost ordered it. Almost. With a bright, pretty floral pattern and a gorgeous, buttery yellow color, this skirt is perfect for wearing to the office. Pair with some flats or kitten heels and a sweater for a perfect early Spring outfit. These sandals (yes, sandals, spring is going to get here, I promise) are the perfect addition thing to wear when you want to look trendy, but don't really have the cash. (They're less than $25. Really.) I would pair them with a striped skirt and a cardigan; but they'd also look great with skinny jeans or shorts. And their somewhat muted canary yellow color is great for the season and goes with just about every neutral. Millennial pink has been on the radar for at least the last year. I definitely noticed a sharp uptick in people dying their hair a really pretty shade of pastel pink last year. As someone with naturally almost-black hair who, even with professional help can't bleach my hair beyond orange, I was really, really jealous. I also remember reading an article around the beginning of last summer about how millennial pink was "the" color of millennials. It's a pretty fair assessment. Look at the packaging for Kim Kardashian's KKW Beauty line. The packaging for Fenty, too, is a pale, pale pink. We're seeing pale pink--and all it's variations--in packaging, flat lays, everything. Rose, dusty pink, rose gold... they all fall into the millennial pink family and it's hot. To read last week's take on forest green, click here. 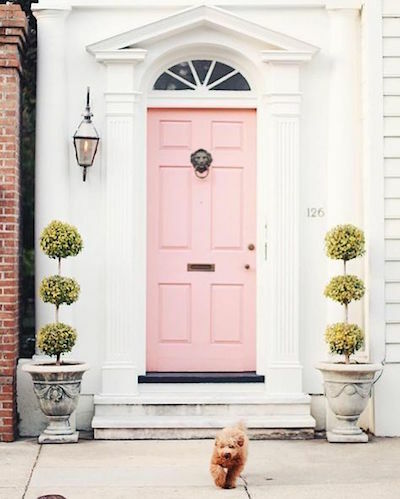 Millennial pink is an almost universally flattering color because it's come in so many shades. Can't pull of baby pink? Try something a little more lavender. Want to go bright? Millennial pink has your back. I mean, look at these Pantone swatches! Prefer a little more coral? It's there too! And this is just a single screenshot of what Pantone considers millennial pink. There are so many options! How isn't this a perfect color for Spring? I've been looking for a denim jacket for ages. They tend to bounce between too fitted and too boxy. This one seems to hit the sweet spot (at least on the model) and, of course, the millennial pink color makes it perfect for dressing your standard late winter outfit for spring. Over dresses and tights? Yes. Layered with a sweater and leggings? Absolutely. I knew I wanted to include one makeup item here--and let me tell you, millennial pink is way easier than forest green when it comes to makeup! This ColourPop Highlighter is only $8, to start, and the sunset-reminiscent millennial pink color makes it perfect for almost all skin types. (I've seen it used as a blush too and it's absolutely beautiful!) The perfect way to add a pop of pink on even your dreariest days. When I first set out to take on this Spring color series, I wasn't sure exactly how I was going to do it. I knew I wanted to include not just style, but beauty items; and I knew I wanted it to be more than some kind of wish list post (which I love, but aren't the most original). I had a hard time really pinning down what I wanted this post to look like, but after a lot of hard work... I got there. (And it should be said: I'm writing this Tuesday evening. Since November, my posts have been scheduled 1-2 weeks in advance, so I've really been spending time thinking on this one! Forest green, to me, is a neutral. As a color, it can vary from the darkest shades to the lighter, olive tones, but it always recalls a deep, dark forest. It's a natural color and one that it almost universally flattering. Green has always been one of my favorite colors. Forest green pairs well with gray, pink, white and cream, black, and coral. When it came to finding inspiration, I picked anything that really inspired me to incorporate forest green into my style for the upcoming season. You know I love woodsy chic anything, so the forest green enamel mugs are right up my alley. I'm looking to add forest green curtains to my living room to go with my lavender-gray wall, so decor pieces have been inspiring me lately. In terms of fashion for spring, forest green is a great color for cable knit sweaters; for those of us who have late summers, we're still wearing sweaters into April and May, and they pair well with skinny jeans and ankle boots. I think it's safe to say the world has been obsessed with palm print in the last few years & it's probably not going away; I'm on the hunt, personally, for a palm print scarf that doesn't break the bank. Now, what 5 items are perfect for adding to your spring wardrobe or makeup collection to add some forest green? Let's talk. Controversially, I love Too Faced palettes; I know some don't love their eye shadow formulation, but I find it's easiest for me to use. This palette is particularly attractive to me--and that pop of forest green in the corner is making me think of ways to save up money for this palette! This palette also contains other complimentary colors, and a super bright pink for the days you aren't feeling so green. On my Spring Color Series Pinterest board, I pinned some ways to wear forest green eyeshadow. It's a green lipstick. You heard me: a green lipstick. Midnight Wasabi from Fenty is really causing waves and for good reason: it looks good on nearly everybody. It's a grey-toned green, almost olive, but still forest-y. And it's really pretty on. If you want to be adventurous with green with spring, Midnight Wasabi is where it's at. It's been a long time since I genuinely wanted a dress from ModCloth so bad it hurt--but this dress is definitely giving me fashion-blogging-circa-2012 vibes. The lattice panel across the shoulders. The high waist with a bow. The floaty skirt. And in a toned down forest green, it's perfect for any special occasion (like a spring wedding!) and with a sweater & tights, you can wear it to work too. Once summer is here, a light cardigan on top and your favorite wedges make it a great weekend dress. Listen, I just planned this dress for every season; it's clearly the best. I wear sweaters almost constantly. I rarely leave the house without a cardigan and my go-to outfit is jeans, ankle boots, and a sweater. So obviously, this sweater from H&M had to make the list; it's a classic shape with no surprises. Have you ever spotted a cute, lightweight sweater in a department store, walked over to it, and discovered it has some random cut out on the back, or some weird design on it? Yeah, that's the worst. That's why I like this sweater: it's the perfect, low-key sweater that you can wear casual on the weekends (jeans & ankle boots, natch) and style up for work (add a blazer & a pencil skirt). Plus, it's just under $20. That's a score! You deserve a treat. A forest green treat. A green tea treat. I love the Body Shop & I recently found out they are officially cruelty-free again (a.k.a., no longer owned by a parent company that tests on animals). That means we can all enjoy their products guilt free. Like this Fuji Green Tea exfoliating scrub: forest green and smelling delicious, it gives you a much needed pick-me-up. Plus, we're all going to be wearing sleeveless tops soon (believe it and it'll be true, right? ), which means we need to make sure our skin is looking snatched. Have something of the forest green variety to add? Let me know on Twitter & don't forget to check out my Spring Color Series board on Pinterest, where I've pinned all my inspiration, favorite items, and more! Way back in November, I got the idea for a series about color for spring. I wasn't sure exactly what I was going to do, or how I was going to do it, but I knew I wanted to do it. I was excited to write about something different, to find ways to display color that were beyond the norm. I wrote it down on my editorial calendar for a few weeks, then immediately forgot about it. Remembering I have these posts coming up got me excited all over again. Overwhelmingly, the most popular colors were: Forest Green; Millennial Pink (obviously); Gray; and Canary Yellow. A good mix of neutrals (I consider forest green to be a year-round neutral) and bright, spring colors. Also, all of these colors can look good together if done correctly. I'll be covering each color separately at first though, then going over some mixes. Which brings me to my next point: if you have a blog post that features one of these colors either in fashion, beauty, lifestyle, decor, or travel... send it to me! I want to see those photos, those links, and more. Just contact me via Twitter or Instagram (or email to your right). I hope you stick around for this exciting series. I'm quite excited to be doing it and I hope you'll love it! A few weeks ago, I got it into my head that I wanted to share my favorite lipsticks. Every day, it's the thing people ask me most often in person: "What's your lipstick?" Especially on Instagram, I get a lot of messages about my lipstick every time I post a selfie. It's one of my favorite things to answer because I do really, really love lipstick! But in the past few months, I've found myself falling into a lipstick rut. Buying the same colors (pink mauves) over and over, wearing the same ones. I decided it was time to make myself remember all the other great colors I have in my collection! This series will be posted every Monday from now through February. I'll cover my favorite reds, pinks, nudes, plums, glosses, and lip balms. Yeah, you heard me: if it goes on your lips, I'll have a post about it including my favorites! If you've ever asked me what lipstick I'm wearing in a photo, then forgot to google it or I didn't send you a link (my apologies), these will the posts where you might spot that lippie again. To make this post just a little more interesting, I wanted to share my criteria for why I consider something a favorite. Everyone has different reasons for liking a lipstick; some people only like mattes, whereas some people find them too drying and annoying. It's such a personal decision, but I made my choices based on these criteria. The color: if the color is great, non-streaky, and looks good on me, I will probably like it. I hate when a color goes on streaky; it immediately makes me wipe it off! The price: affordability is important to me. I have a few lipsticks that cost $10+, but to me, that is outrageous for a lipstick! So, starting next Monday, I'll be posting my favorite reds. I hope you come back to check it out!